That in mind, you’re probably reading this review to answer a two-part question: Should I buy an iPhone 8 now, or should I wait a couple months for the iPhone X? Here’s my answer: It’s complicated. The iPhone X and its edge-to-edge screen was the star of the show a couple weeks ago, but that hype shouldn’t belie the fact that the slightly redesigned iPhone 8 is an impressive piece of hardware that offers most of the same features—for a lot less money. And after spending a week with the iPhone 8 and iPhone 8 Plus, I realize that the cheaper phones are going to be perfect for a ton of people. If you saw an iPhone 8 on the street, you’d probably think it was an iPhone 7. The phone’s overall design is the same, but on the outside, you’ll notice that the iPhone 8 has a glass back instead of a metal one. It almost just looks like it’s been painted with a glossy lacquer, like nail polish. The differences between the iPhone 7 and the iPhone 8 are otherwise less visible. According to Apple, the iPhone 8 is built with “the most durable glass ever in a smartphone.” (Some stress tests suggest that the improvement is marginal, and the iPhone 8 glass can still scratch and shatter.) The Retina display itself also features something called True Tone technology which adjusts the screen’s white balance in different environments. This feature is very noticeable when looking at the iPhone 8 and the iPhone 7 side-by-side, and I believe it is easier on the eyes. 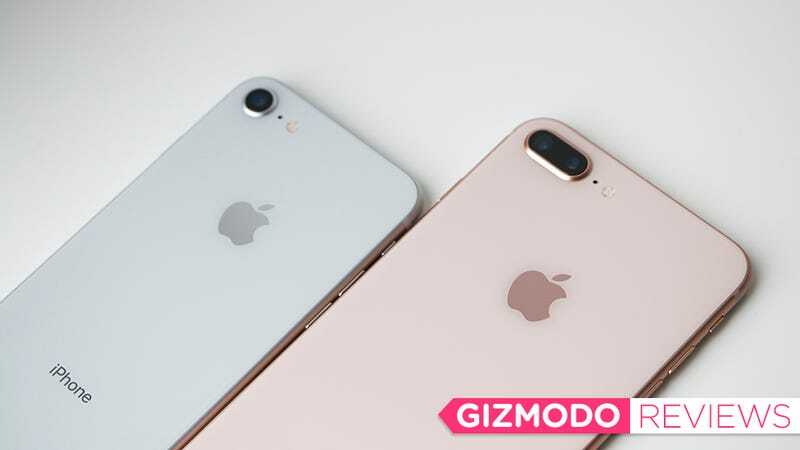 The iPhone 8 and iPhone 8 Plus look just like their iPhone 7 counterparts from the front. 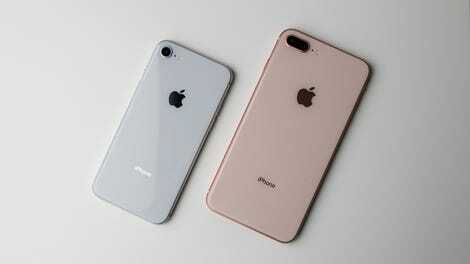 The iPhone 8 camera is improved with a bigger 12-megapixel camera as well as a better flash and better optical image stabilization. The iPhone 8 Plus has a new software feature in beta called Portrait Lighting, a gimmick in my opinion, but a fun one. The processor—and this is neat—is a new six-core A11 Bionic chip that’s optimized for photography and augmented reality apps. Finally, the iPhone 8 has Qi wireless charging. The white and silver iPhone 8 kind of looks like a ghost, but check out that fancier flash module. Most people use their phones for a lot of simple things and a handful of complex ones. You probably text a lot, check your email, and make actual phone calls. (Quick note: Apple has admitted that there’s a problem with crackling noise when taking calls through the earpiece, but a fix is on the way.) You probably use fairly basic apps for stuff like social media, banking, or reading the news. You take photos and the occasional video. And you might play some games that require some heavy-lifting on the processor’s part. If you’re currently using an iPhone 7 or any recent flagship Android, you probably won’t notice much of a difference in how the iPhone 8 handles these day-to-day tasks. But at certain times of day, usually when I was playing Sim City, it’s obvious that the A11 Bionic processor in the iPhone 8 is a snarling beast of a chip. The Sim City app itself loads twice as fast on the iPhone 8 than it does on my old iPhone 7. The gameplay is also smooth on the newer device, whereas I’m used to annoying stutters when moving around my sad, fictional metropolis on an iPhone 7. The new gold color is more of peach and copper combo, but it’s a pleasing combo. What’s really new is augmented reality, and this is where the A11 Bionic processor should really matter. Tinkering around with the limited number of AR games currently in the App Store is fun as hell on the iPhone 8. The Machines, that game we saw on stage at the iPhone event, is brilliantly complex and realistic. It transformed my living room into a futuristic battlefield almost instantaneously, and the gameplay was just as smooth as my old standby, Sim City, on the iPhone 8. Similarly, Monster Park, Giphy, and Ikea Place all offered the best AR experiences I’ve ever had with no lag at all. The only thing is, these AR games performed pretty well on my iPhone 7 as well. This is likely due, in part, to Apple building great software in iOS 11 to offer great AR games on as many devices as possible, regardless of their specs. Generally, though, Apple says that the improved performance in the A11 Bionic chip will make AR apps more stable and render richer details. And the new A11 Bionic chip (left) did smoke the A10 Fusion chip (right) in our benchmark tests. The curved edges on the new glass back make it seem more like a finish than a component of the phone. Another barely noticeable upgrade on the iPhone 8 is the camera. Like the iPhone 7, the iPhone 8 features a 12-megapixel, f/1.8 aperture camera. The specs for both models are identical on Apple’s website. In fact, the only difference in the specs for the iPhone 8 and the iPhone 8 Plus is the addition of the Portrait Lighting mode—which is still in beta, by the way—for the iPhone 8 Plus. However, the teardown from iFixit shows that Apple does include a slightly larger sensor in the iPhone 8 series. This means deeper pixels and richer colors as well as better low light performance. The teardown also revealed four magnets in the camera that go towards improved optical image stabilization. Otherwise, the new camera leans on the A11 Bionic chip for better image processing. While it’s nice that Apple did some hardware and software upgrades for the iPhone 8 camera, most people probably won’t notice the difference in their photos. I took a series of identical shots with the iPhone 7 and iPhone 8 in a variety of settings (sunny day, cloudy day, low light, total darkness), and even as someone trained to spot improved image quality, I have to squint and turn my head to see the difference between the two generations of iPhone cameras. The difference does exist. But boy, oh boy, is it specific to certain situations. All of the photos below were taken at the same time with both the iPhone 8 and the iPhone 7 cameras. In brief, the iPhone 8 does indeed produce richer colors in certain situations. The new camera also performs slightly better in low light conditions. And that new flash is a lot better. Check out the wider range of blues in the sky in the iPhone 8 image. Both offer amazing detail for a smartphone image. See how those reds pop slightly more in the iPhone 8 image. Both look pretty good, though. Again, the red is just a little bit redder in the iPhone 8 image, but both are pretty similar otherwise. It’s difficult to see, but there’s some noise in the darkest parts of the iPhone 7 Plus image that’s not there in the iPhone 8 Plus image. Thanks to a new double exposure feature, the flash in the iPhone 8 Plus captures details in the background that the iPhone 7 Plus flash washes out. See earlier comment about the reds popping more. Otherwise, the optical zoom performance is the same. I don’t see any evidence of Bokeh artifacts, though I do see some reds popping! There’s some bluer blues in the sky on the left, but the portraits otherwise look identical on both phones. The center image is taken with the Studio Lighting option in the Portrait Lighting mode. If we’re just talking about image quality difference between the last generation of iPhone and this one—I can’t see them. I can slightly see some improvements in the flash, but the flash is the component of the camera I use the least, so I don’t really care. You ready for this? You’re about to read a series of words I didn’t think I would write. And I’m humbled to be writing them. The best thing about the iPhone 8 is… wireless charging. In fact, I would argue that it’s almost worth the price of an upgrade for lazy bums like me. I should also add that I expected to be thoroughly unimpressed by the newfound ability to slap an iPhone on a wireless charging pad and top up the battery. Android phones have done this for years! It’s not that hard to plug in a charger! Wireless charging is, however, incredibly convenient, if you’ve got the right set up. Here’s a closer look at that copper tone versus the classic silver. My charging habits are pretty routine, which is largely why I thought wireless charging would be a moot feature. I plug in my phone at bed time. I unplug it in the morning. If it gets low, I plug it in at my office. Now that overnight charge is easy: plug in the phone, unplug it when I wake up. Have I reached for my phone in the middle of the night and forgotten that it’s plugged in and knocked a glass of water onto the floor causing shattering and chaos. Yes, I have. But for the most part, that’s not the issue. Having a wireless charging pad at my office is a game changer. I can plop my iPhone on the pad while I’m at my desk, grab it to run to a meeting, come back, plop, repeat until charged. Who should buy the iPhone 8? By now, it should be obvious that I like the iPhone 8. I like it slightly more than my iPhone 7, and I like it a lot more than my old iPhone 6. So here’s the rundown of what I’d do if I were you and considering buying a new iPhone. If you want the iPhone X, wait six weeks and buy it. Good luck with that, too, because there will almost surely be shortages. It will also cost you at least $1,000. If you have an iPhone 7, and you like it—and it works—you don’t need the iPhone 8. You might want it, and if you can’t help yourself, you might buy the iPhone 8. But you don’t need it. Aside from wireless charging, your old iPhone 7 does everything almost as well as the iPhone 8. Wait for the iPhone 9 or whatever Apple’s going to release next year. The iPhone 8 and its glass back feel a lot like the jet black iPhone 7. If you have an iPhone 6 or older, you should want the iPhone 8. The new design, improved camera, more powerful processor, as well as the addition of wireless charging will rock your world. Depending on how long you’ve had your old device and how much your battery has crapped out, the improved battery life will change your life, too. The iPhone 8 clocked almost 13 hours of video playback in our tests, and iPhone 8 Plus got slightly more. More than anything, though, the iPhone 8 is a good way to future proof your phone life for a couple years. Better devices will obviously hit the market, but the iPhone 8 is as good as they get right now. At least it is for the next six weeks, when the iPhone X starts to ship.